As wet and cold as it was last spring in the mountains of northeastern Pennsylvania, nothing can be taken for granted. In March of 2012, nature appeared to be giving us a pleasant reward for our trials and tribulations last spring, when record rain fell in these parts causing widespread flooding, and the temperatures remained low through most of April. This year, our June weather arrived in March. By the middle of that month, even here in the mountains, the forsythia was blooming ( this is usually an April event at our location). Other blossoms followed, as the dogwoods, and even the cherry, and apple trees began to get into the act. In March, I was somewhat fatalistic about this. Nature is perverse in the Appalachians; just when you think about opening your swimming pool to capitalize on the unexpected spring warmth, a nor’easter will form, and run right up the East Coast, burying your patio furniture in 8 inches of wet snow. But in fact, what did happen in April is that the temperatures cooled considerably, back to what would be considered seasonal or even a bit cooler. 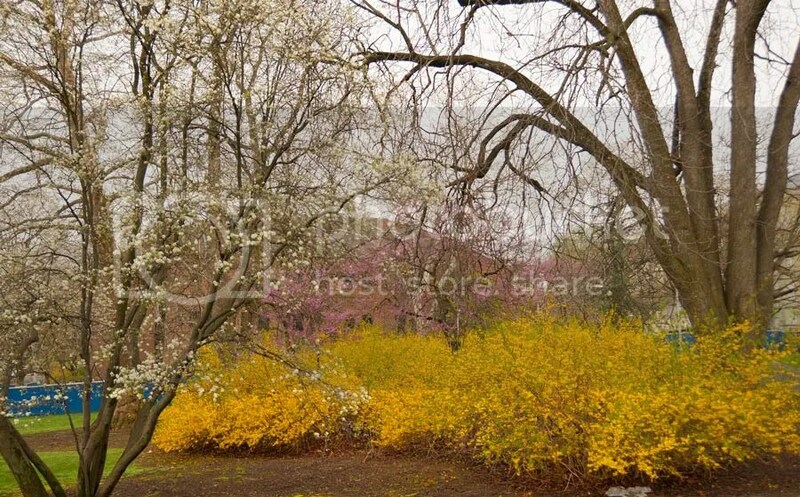 The forsythia and other blossoms became “locked in” by this temperature change, failing to progress on to green foliage. Still the weather remained dry, with little rain. With the lack of a melting snowpack, small streams that normally run until July are already still. It sounds good, except for one thing. In these wooded hills, an early spring like this is likely to create a bad fire season. We tend to see our forest fires in mid spring, when the snowpack is gone but the outback is brown and crisp. My community in particular, is located on the edge of an interesting plant community known as a scrub oak barrens. This ecosystem is populated by a variety of fire resistant plants, some of which are unusual at this latitude. They grow there because of some unique environmental conditions that prevail here. 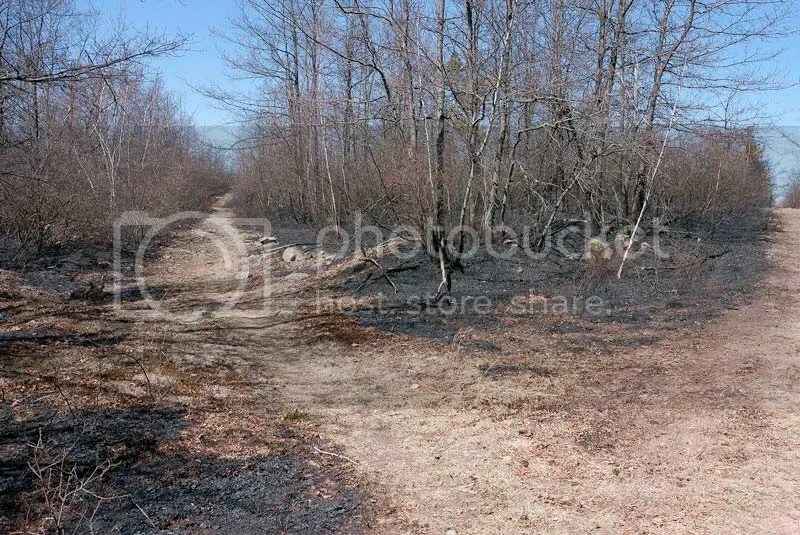 The scrub oak barrens are maintained by periodic fires, which kill the less fire resistant plants like birch trees and red oak which threaten to over top the native barren plants that are shade intolerant. Every couple of Aprils it seems we get such a fire, one that often starts on a state road that runs north and south past the our little community. 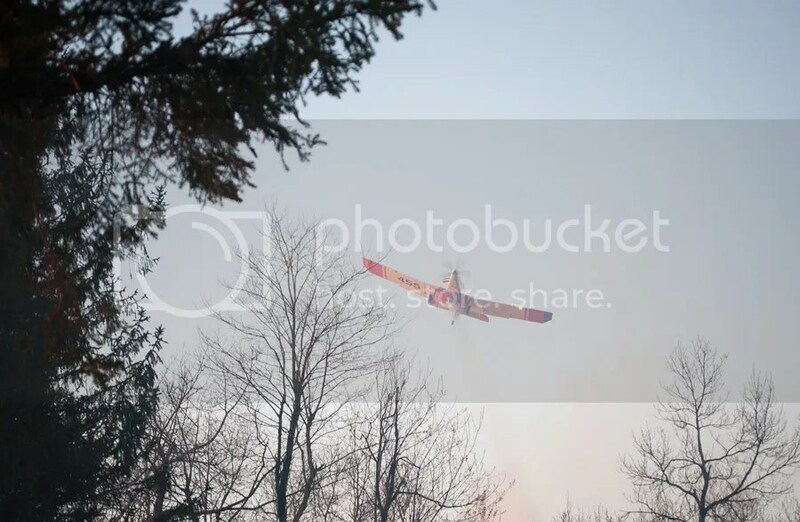 The fire usually starts north of the development and tracks due west with the usual prevailing winds before either being put out by fire suppression efforts, a rainstorm, or by just running out of fuel. Last Saturday was a warm and very breezy day. I just finished a mountain bike ride, and had just returned home when I got a whiff of smoke. As it was about 60°, my first thought was to wonder why my son would have started a fire in the wood stove on such a warm day. Very quickly however the sky darkened, in it and it became clear that the source of the smoke was from a much larger conflagration. Indeed a brush fire started in the usual spot but due to the unusual winds that day (blowing from the north-northwest) the smoke, and ultimately the fire was headed towards our community. Happily the response from local fire departments was robust and rapid. Many units, some from quite far away responded, some with equipment particularly suited to fighting brush and forest fires. A crop dusting aircraft circled low dropping fire suppression fluid for much of the afternoon. A neighbor and I, eager to understand the extent of the blaze, took my UTV out to assess how close the flames approached. We found the edge of the fire but noted that it was not particularly intense, burning mainly the underbrush and sparing the larger trees (though they will likely die from the heat damage to the root system). We did our best to assist the fire officials to understand the location of the problem, and to transport personnel to strategic points. Now my home is on the southern end of the community, quite remote from any fire risk. After the hour or so I returned home, only to find my wife preparing to evacuate. Apparently a community “phone chain” was undertaken to warn the residents about the fire, though perhaps slightly overzealously. Ultimately the fire did come within about five feet of my most northernmost neighbor’s garage. 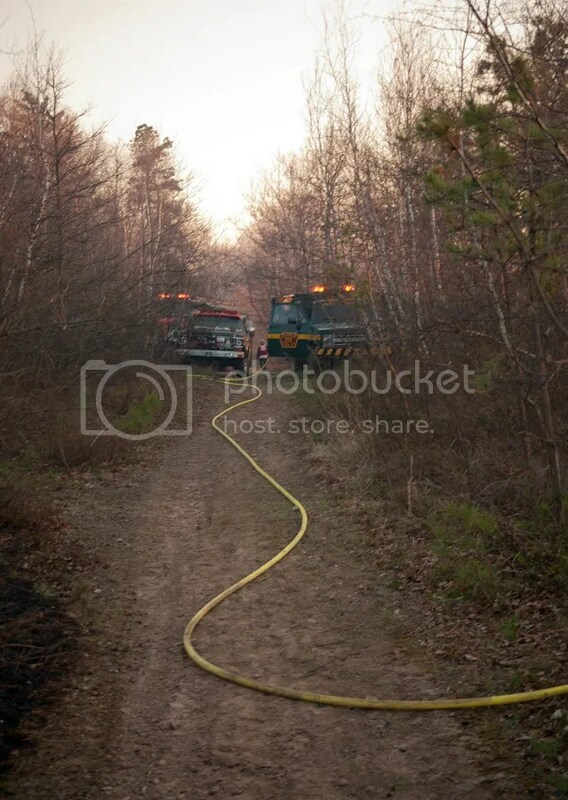 There were numerous fire trucks on their property, and in the surrounding woods . Due to the hard work of the firefighters, by the evening, the fire was controlled, if not completely out. 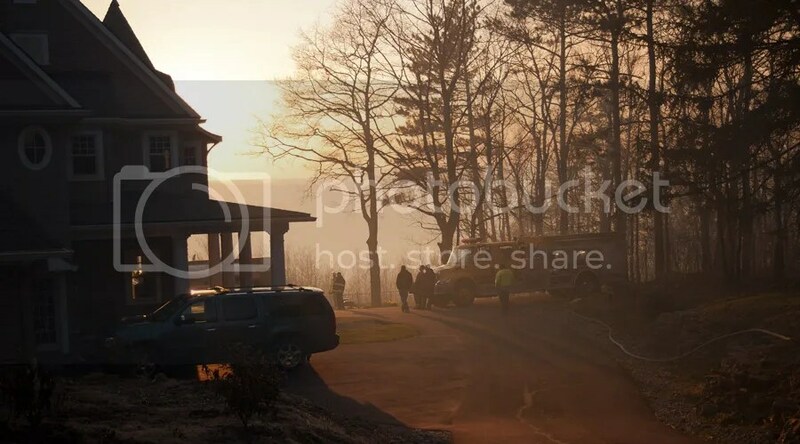 On the next day which was Easter, I walked the property that had burned. Though there was no evidence of active flames, a large contingent of firemen and state officials still patrolled the property to watch for any re-ignition. I thanked everyone I saw. 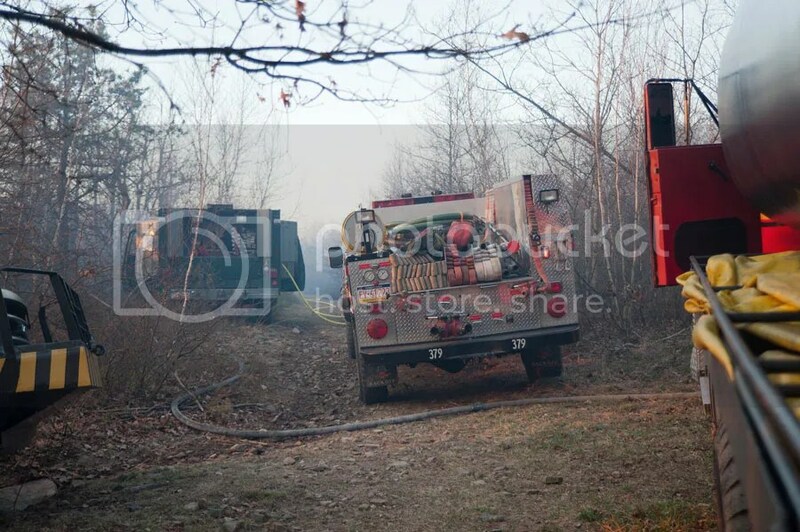 Several days after the fire, a friend of mine told me that she was driving along the route where the blaze was thought to have originated. She claims that she got there at a time when the fire appeared to have just started. She and her companion noted three separate locations along the road that may have been ignition points. This was no stray cigarette. Standing nearby was a young boy of perhaps 15 or 16, with an unusual smile on his face. If this was the arsonist, he, and we, were both very lucky on that windy April day. 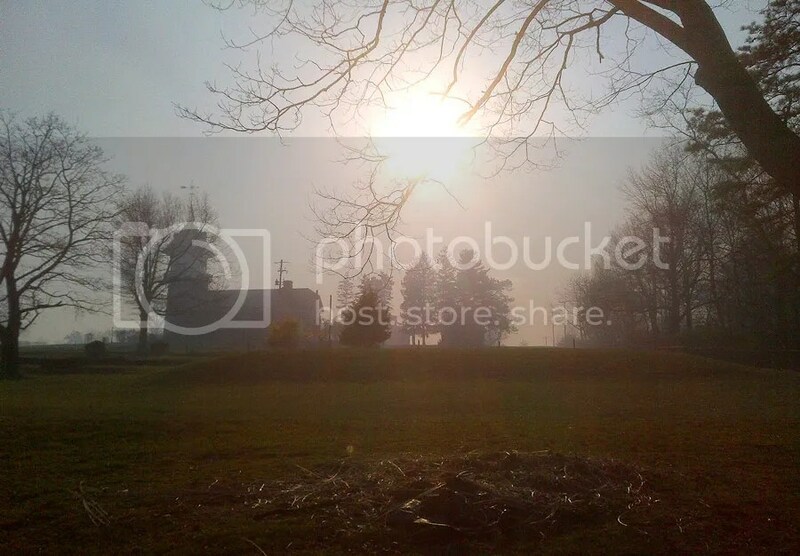 This entry was posted in Uncategorized and tagged atherton hall, nature, outdoors, rim blackberry, weather. Bookmark the permalink. Your photo” Winter Barrens Frost ( Panasonic LX-5)” seems very blurry to me. I thought “The Smoke from the Back of Kirby (RIM Blackberry 9930)” was outstanding given the 5 megapixel camera that lack auto focus. Actually, when the original files are viewed, the Barrens photo is much better than the Blackberry image. I’m not a fan of either imager for landscape, but the panasonic is much better.